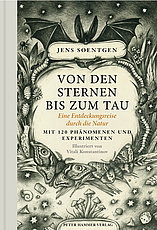 Jens Soentgen’s voyage through nature stretches right through, from top to bottom, from macrocosm to microcosm. In doing so, the natural scientist and philosopher accomplishes something rare: he describes the phenomena he encounters with impressive subject-specific knowledge and romantic enthusiasm. Unearthing magnificent stories from the scientific findings on nature and cosmology, he tells these with such an enthusiasm that you are unable to put the book down. As it is only possible to learn through your own perception, the book contains easy experiments. Luminous bacteria, for example, can be discovered on dead herring and the secrets of Stonehenge viewed on nothing but a window.